Two stories that have become fixtures in the headlines—the deadlocked debt debate and the intensifying News of the World phone hacking scandal—accounted for more than half of last week’s newshole, relegating other significant events to secondary status in the media. During the week of July 18-24, the U.S. economy was the No. 1 story at 35% of the newshole, almost tied with the previous week’s level of interest (37%), according to the Pew Research Center’s Project for Excellence in Journalism. That marked the fifth week in a row that the economy topped the mainstream news agenda, the coverage almost entirely driven by bipartisan disagreement over raising the debt limit and how to trim the budget deficit. That storyline accounted for more than three-quarters of the economic coverage last week. Overall last week, economic coverage was biggest in cable and radio news—the two sectors that include the ideological talk shows—where it accounted for nearly half of all coverage on both platforms. Meanwhile, coverage of the hacking scandal surrounding Rupert Murdoch’s media empire—which last week included his testimony before the British Parliament—rose to 17% of the newshole, up from 12% and 6% the two previous weeks. That high level of media interest in its own industry is somewhat unusual. Last week’s coverage made the scandal the second-biggest media story since PEJ began tracking coverage in January 2007. The No. 1 media-focused story (26%) occurred the week of April 8-13, 2007, when radio talk host Don Imus lost his job for making racist and sexist remarks on the air. The sustained and expanding nature of the story was unusual, too—last week was the third consecutive week that the News of the World scandal ranked among the top five stories. Only one other media-focused story—the release of troves of secret government information through open-source whistleblower Wikileaks—lasted as long in the spotlight (it was a top-five story for three straight weeks in December, 2010). That story, however, decreased in media attention each week over that period, while the News of the World scandal has thus far increased each week. The No. 3 story last week was a major heat wave that made its way from the Midwest to the East Coast, accounting for 5% of the newshole. By the end of the week, news outlets were reporting that as many as 34 people had died due to the extreme heat. The U.S. presidential campaign came in at No. 4, at 4%. In recent weeks, the public and media attention to the deficit debates in Washington have easily overshadowed the campaign as a major story. Indeed, since July 4, the campaign has only accounted for 4% of the newshole. The No. 5 story, at 3% of the newshole, was the end of the final mission of the NASA shuttle Atlantis. That marked the end of an era, and news organizations took the opportunity to reflect on the decades of space exploration by the U.S. program. The week’s No. 6 story (at 2%) was the worst attack in Norway’s postwar history when one man allegedly orchestrated a bombing and a shooting that left nearly 100 people dead. 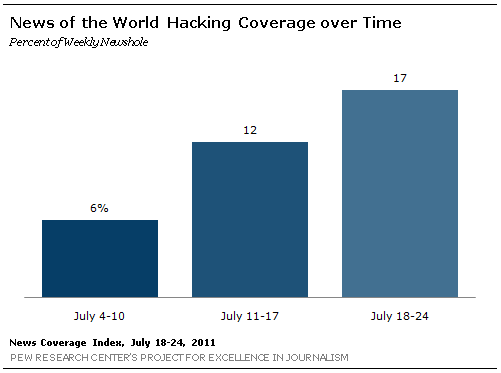 The July 22 attack occurred late in the week, which may explain the relatively low level of coverage in the Index. With the debt default deadline looming ever closer, the mood in Washington has grown tenser, something that the news media have started to reflect. After about a month of covering the roller coaster negotiations, there were hints of weariness and resignation last week among the nation’s news outlets. After President Obama’s separate July 20 meetings with Republican and Democratic congressional leaders, reporters feared that the two sides were moving further apart. Still, through the middle of the week, the coverage reflected some hope that President Barack Obama and House Speaker John Boehner might be able to work together to achieve a significant compromise through a combination of tax increases and spending cuts, even though that deal might be unpopular with members of their own party. There were even reports that a major deal was imminent, though this was quickly quashed on July 21 by White House Press Secretary Jay Carney. That hope seemed to evaporate on July 22, when Boehner fired off a letter essentially ending those talks, right before the evening network newscasts went on the air. The speaker and the president were “on the verge of an historic deal,” said ABC’s John Karl, adding that after the two were unable to agree on concessions, the prospect of any significant solution to the budget and debt crisis was unlikely. That evening, excerpts from dueling press conferences by Obama and Boehner, in which each criticized the other for inflexibility, appeared on all major cable and broadcast networks. Last week’s coverage of Rupert Murdoch’s tabloid scandal began with another significant resignation. The head of Scotland Yard, Sir Paul Stephenson, resigned on July 17, becoming what the New York Times on July 18 called “the latest casualty of the phone-hacking scandal engulfing British public life.” It happened only hours after embattled News of the World former editor Rebekah Brooks was arrested. “Many are questioning whether the media mogul can slow what many are calling the meltdown of his media empire,” reported MSNBC that afternoon. On Tuesday July 19, cameras were trained on Murdoch and his son, James, who answered questions before a British legislative panel on their knowledge—or lack thereof—about phone hacking. The testimony was interrupted when a British comedian threw a shaving cream pie in the elder Murdoch’s face, a moment that was replayed over and over again on television and on the web. 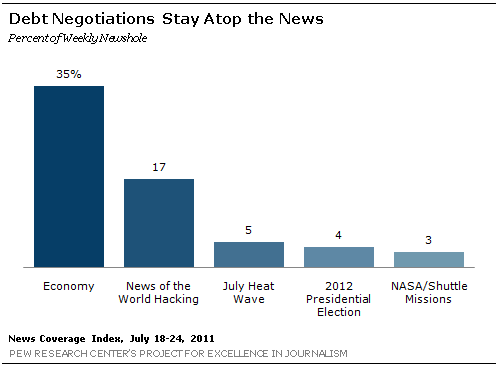 Indeed, nearly half of last week’s News of the World coverage studied by PEJ occurred on Tuesday. Some media reactions offered a less than favorable view of Rupert Murdoch’s performance, despite whatever sympathy a pie in the face might have earned him. Some chose to turn their ire to the rest of the mainstream media, however, for its fascination with the story in general. Though the bulk of coverage occurred in the first half of the week, by July 21 the media had some new developments to report on. The U.S. Department of Justice issued subpoenas in its inquiry into whether September 11 victims had their phones hacked by News Corp., and James Murdoch’s testimony before Parliament was challenged by two former News of the World Employees who claimed he knew the hacking was more widespread than he indicated. Extreme heat in the Midwest that then moved to the Eastern Seaboard broke records and contributed to a number of deaths, all of which accounted for significant news coverage. The No. 3 story of the week, the heat wave (5%) also drew somewhat more attention as it moved East and toward the bigger media markets: The amount of media attention on Thursday and Friday was double that of Monday and Tuesday. At No. 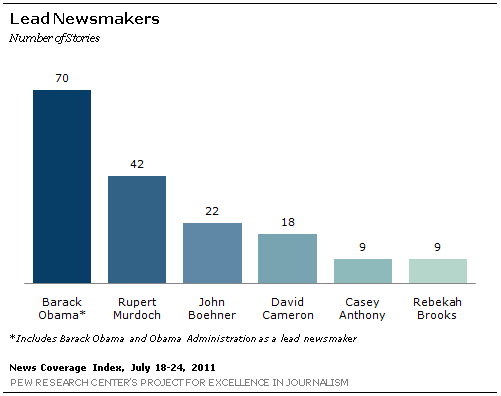 4 was the 2012 presidential campaign which, for yet another week, achieved relatively little media attention. Coverage last week was driven by a mix of news items about Republican candidates, including Mitt Romney’s poll numbers and questions about the severity of Michele Bachmann’s migraine headaches. Finally, at No. 5, was the return of the space shuttle Atlantis, marking the end of the NASA shuttle program, and “ending the three-decade lifetime of a technologically remarkable and versatile spacecraft, the likes of which the world is unlikely to see for a very long time,” according to the Washington Post on July 21. There was also a high level of media interest on three key players in the News of the World hacking scandal, including News Corp. Chairman Rupert Murdoch (No. 2 at 5% of stories), British Prime Minister David Cameron (No. 4 at 2%), and former News of the World editor Rebekah Brooks (No. 5 at 1%). Last week marked the second one in a row in which Murdoch was the No. 2 newsmaker. Tied with Brooks (1% of stories) was Casey Anthony, now acquitted on the major charges related to the death of her young daughter, and left to ward off the attention of news organizations eager to catch a glimpse of her in public. PEJ’s weekly News Coverage Index examines the news agenda of 52 different outlets from five sectors of the media: print, online, network TV, cable and radio. (See List of Outlets.) The weekly study, which includes some 900 stories, is designed to provide news consumers, journalists and researchers with hard data about what stories and topics the media are covering, the trajectories of that media narrative and differences among news platforms. The percentages are based on "newshole," or the space devoted to each subject in print and online and time on radio and TV. (See Our Methodology.) In addition, these reports also include a rundown of the week’s leading newsmakers, a designation given to people who account for at least 50% of a given story.